Three of the new judges won't need to buy robes: Jean Margaret Cocozza, James Lewis Kaplan, and Marc William Martin are all currently serving as Circuit Court judges pursuant to Supreme Court appointment. Judge Kaplan, like Judge Peter Vilkelis in the last round of associate judge selection, was elected as a write-in candidate; he was not on the "short list." Martin and Patrick Joseph Heneghan were both unsuccessful candidates for election to the Circuit Court in the March primary; neither Judge Cocozza nor Judge Kaplan ran this year. Geraldine Ann D'Souza and Edward Nicholas Robles were both finalists in the 2014 associate judge selection process. First District Appellate Court Justice Laura Cha-Yu Liu, the state's first Asian-American Appellate Court justice, died late Friday afternoon after a courageous five-year battle with breast cancer. A statement released by her family stresses that Justice Liu "refused to be defined or constrained by her illness." 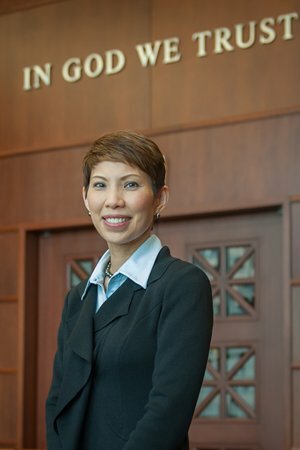 In addition to being the first Asian-American to serve on the Illinois Appellate Court, Liu will be remembered as the first Chinese-American to be elected to public office in Chicago and Cook County and the first female Chinese-American to serve as a judge. Fluent in Mandarin Chinese, the Illinois Supreme Court asked Justice Liu to chair its Language Access Committee, to ensure the court system was navigable to those whose first language was not English. Justice Liu was first elected to the Circuit Court in 2012 (she ran, unopposed, from the 8th Subcircuit). She was appointed to the Appellate Court in 2014. Justice Liu is survived by her husband, Michael J. Kasper, and a daughter, Sophia. To honor Justice Liu's memory, the family has established the Justice Laura Liu Scholarship Fund at St. Therese Chinese Catholic School. The fund will benefit needy children active in community service. Donations may be made at www.StThereseChicago.org or mailed to 247 W. 23rd Street, Chicago, Illinois 60616. For more on Justice Liu's life and career, see Dustin J. Seibert's profile in the June 2014 Chicago Lawyer (from which the accompanying photo is taken) or this February 1, 2014 David Ormsby piece for the Huffington Post. First and foremost, last month's Democratic primary set a new record for judicial votes cast. Unofficially, the median number of votes cast in the eight countywide contests was 836,222. As illustrated below, this total outdistanced the previous high of 795,418, set in 2008, and marked only the third primary with more than 600,000 judicial votes since partisan judicial primaries debuted in Cook County in 1974. Not surprisingly, the three--1984, 2008 and 2016--were headlined by three of the most spirited and competitive Democratic presidential primaries over that time span. Last month's high voter turnout and the extra judicial votes it generated had a huge impact on the results of both countywide and subcircuit contests. Using the procedure that I developed for studying groups of nonpartisan or party-primary judicial contests, I analyzed the results of the eight countywide contests. The small size of the data set -- only 23 candidates in eight contests (and one contest distorted by a late withdrawal) -- was a potential problem. But for the most part my procedure produced useful estimates of the impact sizes of the factors that historically have the strongest influences on judicial voting. I must emphasize that the individual estimates are just that -- estimates -- and have margins of error of various sizes. However, they are very consistent with estimates from previous primaries having larger data sets, and as a group they "fit" the data set quite well. Generally the impact sizes correspond closely to those of the 2008 primary. Above all, the impact of gender, on two primary ballots topped with a female presidential candidate (and the same candidate at that). In 2008 gender conveyed an advantage of roughly 23 percentage points per contest, to a single female or divided among multiple females. The advantage this year was in the 20-22 point range. Gender typically is the most influential factor in the county's judicial contests, but it also is the most variable and has been as low as 6 percentage points. Its impact this year was one of the largest impacts ever of any factor in any single primary. As for slating, it conveyed an advantage of only 4-5 points. Notably, this is the one major difference between last month's primary and 2008's; in the latter, slating was roughly twice as valuable. A common misconception about slating is that without exception, its impact varies inversely with voter turnout. That is not the case; turnout does affect it but so do other important factors such as the mood of the electorate and the popularity of the party and its leaders on election day. Another common misconception is that the Irish-name advantage long observed in the county's judicial contests behaves like gender, rising and falling in lockstep with turnout. In fact, it is surprisingly stable from year to year and much less variable than gender. Its long-term average has been 9-10 percentage points; its value in 2008 was roughly 11 points; and last month was roughly 13 points. The one historically important factor that I could not estimate satisfactorily is ballot position. The data set had too few contests to allow it. However, the clearest evidence of its impact is seen in the two-person contest for the Walsh vacancy. Fredrick Bates, the party-slated and Tribune-endorsed candidate, was narrowly defeated by Patrick Powers, who held not a single advantage over Bates besides the first ballot position. In recent years the value of the first ballot position had increased to the range of 7-8 points, and in eyeballing last month's result a similar impact is very plausible, if not provable. As for the subcircuit contests, a single group of them cannot be analyzed in the same manner as above because of significant differences in impact sizes among different subcircuits. (Also, full information on campaign spending is not yet available, and unlike in the countywide contests campaign spending has a significant effect on subcircuit contests.) However, a simple accounting shows the primacy of gender across the entire county. Including the subcircuits, there were eighteen contests in which at least one male candidate faced at least one female candidate. Fourteen of those contests were won by females. Two others had a lone female with a surname of an ethnicity that has been historically disadvantageous. The remaining two were in the 5th Subcircuit, where gender has been slightly less influential than elsewhere in the county and where last month's surge in judicial votes was the smallest of all of the subcircuits holding judicial contests. As a basis for comparison, slated candidates and Tribune-endorsed candidates had success rates of less than 50 percent in all contests. In short, this was a very good year to be a woman running for judge in Cook County. Albert J. Klumpp has been a generous and frequent contributor to this blog over the years. A research analyst with a public policy PhD, Klumpp is the author of several scholarly works analyzing judicial elections including Judicial Primary Elections in Cook County, Illinois: Fear the Irish Women!, 60 DePaul L. Rev. 821 (2011); "Voter Information and Judicial Retention Elections in Illinois," 94 Ill. B.J. 538 (October 2006); and "Cook County Judicial Elections: Partisanship, Campaign Spending, & Voter Information," CBA Record, January 2007 (p. 34). Many people with whom I've discussed the outcome of last month's primary election mentioned voter anger and discontent as a motivating factor in the turnout. People are dissatisfied with the status quo, I was told, and that discontent was represented best in the outpouring of support for Sen. Bernie Sanders in the Democratic primary and for (Heaven help us all) Donald Trump in the Republican. Of course, these opinions are not particularly novel: Virtually any talking head on cable news, when MSNBC, CNN or Fox, is spewing something similar at any given moment. Just because these tales of voter anger and discontent are widely shared and believed does not make them false -- or true. But voter anger is, I think, too general an explanation to account for any outcomes in judicial elections. I did ask a number of people whether voter discontent in African-American communities with the State's Attorney might have spilled over into an anti-incumbent, anti-establishment vote generally in those areas. I found no one willing to agree with that hypothesis. Instead, a number of people told me that the poor performance of Democratic Party judicial candidates in the primary, at both the countywide and subcircuit levels, stemmed from defections among the committeemen and defective strategies in some campaigns. There's no question that there were some Election Day defections by committeemen from the judicial slate. It was ever thus: Some candidates are more slated than others. Of course, I didn't come close to catching them all... such as this palm card from the 41st Ward showing the organization there supporting Carolyn J. Gallagher over slated candidate Chaudhuri. And I live in the 41st Ward, too... but there wasn't anyone passing out these cards when I went to my polling place on that Tuesday afternoon. But that brings up another point. Some judicial candidates have more skill at politics and campaigning than others. The skills that make someone a good lawyer, such as a talent for research, a dogged determination to understand and organize facts or precedents, a cautious and thoughtful mode of expression -- these skills may serve a judicial candidate well before the bar associations... but not be very helpful on the cocktail party circuit or in dealing with professional politicians, where a certain amount of bonhomie and 'glad-handing' is required. I have often insisted that judicial candidates are different than candidates for other political offices because most judicial candidates are not professional politicians. One of my favorite examples dates back to the 2008 primary, when I first did my Organizing the Data posts. When I put my post for this particular candidate's race, he immediately sent me an email. I had inaccurately stated a bar rating for one of his opponents, he wrote. I had said that his opponent received a "Qualified" rating from one of the bar groups when in fact that candidate was actually rated... wait for it... "Highly Qualified." I don't think that happens too often in races for the state legislature or the City Council. Some judicial candidates, who might be very productive judges if given the chance, may find venturing too far out of their comfort zone and onto the campaign trail highly stressful. On the campaign trail, judicial candidates invariably run into opponents, or opponents' supporters. In my spectacularly unsuccessful career as a judicial candidate, I always felt a kinship with those I saw out on the hustings; maybe being thrown together on so many occasions gave us all some form of Stockholm Syndrome. But some candidates may react to their opponents and their opponents supporters in an adversarial way. Well, we are supposed to be zealous advocates after all; that is our training, but it is not a way to win friends and influence people in a campaign. Other judicial candidates may seek to avoid the stress of the campaign trail by not venturing out at all -- or on as few occasions as possible. I have heard that at least some slated candidates may have chosen to sit back and let the 'establishment' carry them into office. If the rumors about these particular candidates are true, their expectations were not realized. I have previously suggested that slating -- and the $40,000 payment to the Democratic Party for countywide slating (I don't know what is asked of slated subcircuit candidates; no one's ever told me) -- buys only credibility and access. Frustratingly, for some candidates, "access" means access to invitations to spend still more money -- everyone needs to raise funds and judicial candidates are apparently expected to be a gift that keeps on giving. As aggravating as that may be for some candidates, it would be far worse to put one's fate in the hands of a consultant who can get a candidate slated -- but who does nothing thereafter to advance the candidate's chances. And the demands for money are not limited to politicians' fundraisers. Candidates are asked to spend money for advertising, for 'street money' -- to pay people, for example, to hand out reminders for the candidate at the polls. What should the candidate spend money on, even after being slated? The best one word answer I've been given is: Everything. Case in point: I've been told that several African-American judicial candidates did not advertise on African-American radio stations in the weeks leading up to the primary. Judge Patricia S. Spratt, who is not an African-American, did advertise on African-American radio stations. Is that alone enough to explain Spratt's fairly narrow margin of victory in her 7th Subcircuit race over Jennifer Ballard? Maybe not; one must also take into account the significant support given to another African-American candidate in that same race, Mable Taylor. While we're on the subject of Judge Spratt, an anonymous commenter sent me a link to this contribution record on the ISBE website, showing that Spratt's campaign made a $10,000 donation to something called the Illinois Alliance on March 11, the Friday before the election. Illinois Alliance, in turn, appears to have been formed on March 3 by former Ald. Ike Carothers, a nephew of recently retired Judge Anita Rivkin-Carothers, whose vacancy Spratt was seeking. Former Ald. Carothers, you may recall, did some jail time a few years back after pleading guilty to federal corruption charges. A couple of other candidates put some money into this venture as well, but no one put as much money in as Spratt's campaign. Now I suppose that this is the part of the story where I'm supposed to wring my hands and decry the corrosive influence of money in judicial elections... but I'm finding it hard to work up the requisite dander. Here's why: If judicial candidates are different than political pros, they particularly need the assistance of those more, um, familiar with the realities of finding votes in Chicago. I haven't the faintest idea what, if anything, Mr. Carothers did with the donations Spratt and others made to the "Illinois Alliance" or whether any actions he may have taken had any influence in that subcircuit race. If Judge Spratt's campaign managers were smart enough to find someone who gave value for money received, good for them. Some campaigns never quite get going. The Travis Richardson campaign may be an example of this. Like Judge Steven Watkins before him, Richardson lived in the 3rd Subcircuit for some time before deciding to seek a 2nd Subcircuit vacancy. (Watkins, FWIW readers may recall, ran from the 3rd Subcircuit in 2010 before relocating to the 2nd Subcircuit in time to win election there in 2014.) Richardson moved into the 2nd Subcircuit in time to file for 2016, but his family remained behind in the 3rd. Two challenges were made to Richardson's residency and a hearing officer decided to rule him off the ballot. Although there was a dissent, the Cook County Electoral Board reversed that decision, holding that Richardson had successfully planted himself in the 2nd Subcircuit and was eligible to run there (Electoral Board decisions here and here). The challenge to Richardson's candidacy was carried into the Circuit Court on judicial review, and the Electoral Board ultimately affirmed, but this came apparently too late in the campaign season for Richardson's campaign to regain lost traction, his positive bar ratings and Tribune endorsement notwithstanding. According to my sources, Richardson was strongly supported by 21st Ward Ald. and Committeeman Howard Brookins and 34th Ward Ald. and Committeeman Carrie M. Austin, but Richardson trailed the field in these wards just as he did in the subcircuit as a whole. Is Richardson's unhappy showing entirely attributable to the distraction of the lengthy petition challenges? From my vantage point, I can not say. But I can say without hesitation that it didn't help. Next up: Another guest post, this one from frequent FWIW contributor Albert J. Klumpp, PhD. As you will note from the post below, the 2018 primary season is already underway -- can you believe it? Here at FWIW, we're still sifting through the ashes and embers of the 2016 campaign, looking for clues and trends and lessons that might be helpful in future campaigns... oh, wait, we've started the 2018 campaign season here, too, aren't we? It was a tough election for a lot of sitting judges, slated candidates, and male candidates generally. In contested countywide judicial races, six candidates already sitting as judges pursuant to appointment by the Illinois Supreme Court, all slated by the Democratic Party, three male and three female, tried to hold their seats. Only four did, including each of the female candidates. The Democratic Party carried only four of the eight candidates it slated in countywide judicial races. Still, it did better than the Tribune. In the eight contested countywide judicial races, only three candidates backed by the Tribune were successful. And it was arguably worse for men, slated candidates, and appointed judges in contested races in the Subcircuits. In the 1st Subcircuit, both of the judges, both slated by the Democratic Party, one male and one female, were rejected by the voters. Judge Maryam Ahmad was defeated by Jesse Outlaw; Judge Anthony E. Simpkins was defeated by Rhonda Crawford. Crawford did not participate in the bar screening process; Outlaw did not participate in the CBA screening process, but was rated qualified, recommended or better by each of the Alliance bar groups. Simpkins and Ahmad were both endorsed by the Tribune. In the 2nd Subcircuit, slated candidate Travis Richardson, who had strong bar ratings and the Tribune endorsement, lost to D. Renee Jackson, a candidate who did not participate in the bar screening process. Actually, Richardson finished fourth, the only male candidate in a field of four. The two contested races in the 5th Subcircuit departed from the New-Year-of-the-Woman script: Associate Judge Leonard Murray beat Jameika Mangum. Murray had the Tribune's support, but so did appointed Judge Robin D. Shoffner -- and she lost to Daryl Jones. Judge Anna Loftus beat the slated candidate in the one contested 6th Subcircuit vacancy; she did have the Tribune's backing. The Tribune backed Judge Patricia S. Spratt, who won her contested 7th Subcircuit race over a crowded field that included the Democratic Party's slated candidate, Jennifer Ballard. Judge Jerry Esrig was slated and endorsed by the Tribune and faced only one challenger, another male. He won his 9th Subcircuit race. Judge Eve Reilly was not slated initially, but she wound up slated when the originally-slated candidate withdrew. She did not enjoy the Tribune's endorsement in her 10th Subcircuit race, but she finished first in her four candidate race. There were two men running against her and one woman. Judge Reilly's nearest competitor was the other female candidate. Judge Marc Martin faced one male challenger and one female in his 11th Subcircuit race. He enjoyed the advantages of incumbency, the Tribune's endorsement, and the backing of the Democratic Party. He finished second to Catherine Ann Schneider. Two of the three slated Democrats running in the 12th Subcircuit won their contested primary races. James E. Hanlon, Jr. had only one male opponent. The other successful slated Democrat, Janet Cronin Mahoney, also had just one male opponent. Both Hanlon and Mahoney were endorsed by the Tribune. But the Democratic Party's slated candidate in the race for the 12th Subcircuit Kazmierski, Jr. vacancy, Louis G. Apostol, had two female opponents, and one male. Associate Judge Marguerite Anne Quinn grabbed nearly 45% of the vote in that race; Jennifer Bae finished second with nearly 31%. Quinn had the Tribune endorsement. There were two contested Republican primary judicial races, one in the 12th Subcircuit, one in the 12th and one in the 13th Subcircuit. Steven Kozicki won his race in the 12th Subcircuit, while Kevin O'Donnell won in the 13th. Kozicki did have the backing of the Tribune. O'Donnell had neither the Tribune nor Republican Party slating. Six of the eight Supreme-Court-appointed judges running in contested subcircuit races were slated (if Shoffner counts as slated, which I think she does, though I never had official confirmation). Of the six slated, only two, Esrig and Reilly, won. And Reilly was not the Democratic Party's first choice; the party's originally slated candidate withdrew. The two sitting judges who ran without the official backing of the Democratic Party, Loftus and Spratt, both won, and both are female. The Democratic Party got its candidates elected in only five of the 13 contested subcircuit vacancies (again, assuming that Shoffner and Murray were slated in the 5th). The Democratic Party won one of two contests in the 5th Subcircuit, the races in the 9th and 10th Subcircuits, and two of the three contested races in the 12th. Both the 12th Subcircuit winners -- all four of the 12th Subcircuit winners, actually, will face Republican opponents in November, so their election can not, at this stage, be assumed. The Tribune actually did better than the Democratic Party in the subcircuits: Eight candidates endorsed by the newspaper won their respective subcircuit primary races, including one of the two Republicans receiving the Tribune's nod. That means the winner of the newspaper's endorsement also won in seven of the 13 contested Democratic primary races. By comparison, the total number of Democratic ballots taken in Cook County in 2014 was only 285,728 (169,922 Republican ballots). Of course, 2014 was not a presidential year. In the most recent presidential election year, 2012, voters took 440,873 Democratic ballots in Cook County, while 200,750 voters took Republican ballots. But President Obama faced no opposition in 2012. The 2008 primary provides a better comparison; that was the last time the presidential circus pulled into town without the outcome in both parties being already decided. And, no surprise, turnout was darn near as high in 2008 as in March of this year: 1,086,984 Democratic voters and 179,464 Republican voters took ballots in Cook County eight years ago. But, in 2008, the Democratic Party carried six of its nine slated candidates to victory in contested countywide primaries, as opposed to only four of eight this year. And, in 2008, as in 2016, several appointed judges had trouble holding their seats in contested subcircuit elections. But, as the old saying goes, all politics is local. In Cook County, politics is so local, it's often personal. The overall picture is not changed by looking at some of these individual stories, but perhaps the strength of the trends can be explained, at least in part, by examination of some of the stories involving individual campaigns. More on some of these in my next post. The Lesbian and Gay Bar Association of Chicago is presenting a free seminar on Friday, April 8, from 3:00 to 6:00 p.m., at Hinshaw & Culbertson LLP, 222 North LaSalle Street for persons interested in serving in judicial office. The CBA and Alliance judicial evaluation processes will be explained, sitting judges "will address the various paths to the bench in Cook County," and two federal judges and representatives from the offices of Senators Durbin and Kirk will discuss how appointments to the federal bench get made. Susana Darwin, Co-Chair, LAGBAC JEC. The seminar is not only free, but offers 3.0 Professional Responsibility CLE Credits. But seating is limited and registration is required. Interested persons need to RSVP as soon as possible to DIVERSITY@hinshawlaw.com. The seminar is sponsored by the Hinshaw LGBT Affinity Network and ISBA Mutual.